I read in a book that there are five species of tigers and that all are endangered. I'd hate for my grandchildren to view tigers the same way we do dinosaurs, wouldn't you? CLICK to see a larger photo of the finished craft (made by Tasha at Age 4, printed on orange construction paper). Close the photo window once you have finished viewing to get back to this page. 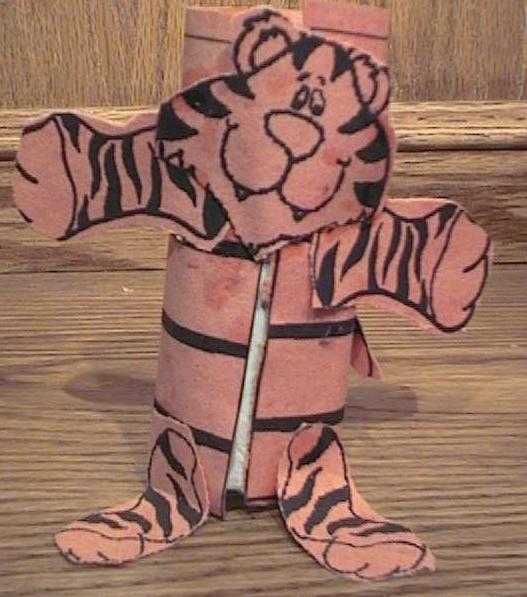 A different looking tiger toilet paper roll craft can be found here. Color the pieces as appropriate and cut them out. Glue the large rectangular piece around the toilet paper tube. Glue on the chest. (oval). Glue on the head, arms, legs and tail. If you choose the Black and White template, try printing one copy on orange construction paper and one on white. Then mix and match the pieces.